After you get over the shock that there is a real European cannabis church, you might wonder, what is it about. Our church is helping to unite growers of the holy herb. Within the cannabis community, there are different people and roles. The happy hippie to the grandma stoner business woman, cannabis is used by a complete cross section of society. The growers of the herb are a unique part of this clan. They are the ones with supreme patience. They understand the plant. They grow and die with each harvest. These are the priests of our group. Our church is full of people who love the herb. You don’t have to smoke or have dreadlocks, you just need to have love and respect for yourself and everyone else. The prohibition of cannabis tried to stamp out more than just the plant. Authorities don’t like friendly, open, thinking people who question why the world is the way it is. The war on drugs was a very real war. Only police had guns however, and they used them to steal liberty from some of our peace loving, cannabis community members. If you are a member of our church, these police actions, are legally speaking, religious persecution. The plant we love is a powerful medicine, it is non toxic and natural. There is no scientific reason why cannabis is illegal. Alcohol is perfectly legal and much more dangerous than cannabis, so as I said, the authorities just don’t seem to like us. Telling the truth in our modern world, is a crime. Our societies have grown used to politicians and officials who lie in double speak. Our Church pre-dates all laws on cannabis. The European Church of Cannabis is the Reformed Church of Mithras. Mithraism was the religion that Christianity never wanted you to know about. Mithraism was the last strong pagan religion before Christianity took control. Most christian religious symbols come from Mithras and other Pagan faiths. Mithras’ birthday was 25 of December for example. Mithraism has seven levels. Each time a member gets initiated into a deeper level, the ceremony uses cannabis to celebrate. It has carried out these rituals for only the last 4,000 years!! The church consists of small groups, usually not more than 40 or 50. Our European church is reformed Mithraism, because unlike the old religion which didn’t allow women, we welcome everyone that is friendly and open. It isn’t until we gather together, that our real strength is understood. We are non violent and we expect our freedom to live according to our personal beliefs to be respected. The state plays a very important role as managers of our societies, but they do not get to dictate how we should live. We are supposed to have natural freedoms. Our church is not about one specific place, yes in time we will have real religious spaces but we are the rebirth of an ancient religion which always begins in our own hearts and minds. As soon as you want to be a part of the church, you already are. You can conduct a sermon on your own or with a group. We need people from every European country. We can start with a small number that is organized. With a little divine intervention we will be uniting against state cannabis oppression. When we are together, we are strong. This world works on highlighting our differences and keeping us all separate. When someone joins our church from one country, he or she can go to any of the other churches and be treated like a local by their fellow clan members. Here is an interesting video on the history of cannabis. We are faced with an ignorant system that is only interested in projecting its power. We are living in the new Dark Ages. The beauty of a human soul isn’t held within a country’s legal system. Souls must find their own way to sing sweetly. We were born free but somewhere along the way we have become enslaved. Justice is dying. My fellow cannabis brothers and sisters are being oppressed. We love the herb, I think it is a messenger from Mother Nature, but that is just me. All of our civil rights have been destroyed the moment a government knowingly punished someone for a healthy lifestyle choice. Organically grown cannabis is healthy for you. The science is too strong to deny anymore. The Jews that were slaughtered in the second world war holocaust did as they were told. They gave up their rights, their possessions and then their freedom. Since that war they have said over and over not to forget. The trouble is, fascism has many faces. Today fascism is in the strict adherence to the rule of law. Don’t walk on the grass, don’t smoke the grass, don’t feed the homeless, don’t listen to your inner voice, listen to the police megaphone declaring the truth according to brute strength. The rule of law is a spiders web. When old Jewish people tell us not to forget their holocaust, they are talking about the battle that each human being must face. If I witness injustice, I am part of the problem the moment I decide not to act. Our governments are too powerful. As cannabis activists, we want our civil rights respected. We are not going to obediently get into stinking trains this time. Freedom is worth fighting for. Civil disobedience is your duty when laws are unjust, and don’t kid yourself, these laws that seek to strangle us are unjust. Rivers shouldn’t be polluted, food shouldn’t give you cancer. It is time for change. First look within. You are perfect. You were born with the loving strength and knowledge of all that has gone before you. It is time to stand up for your rights. 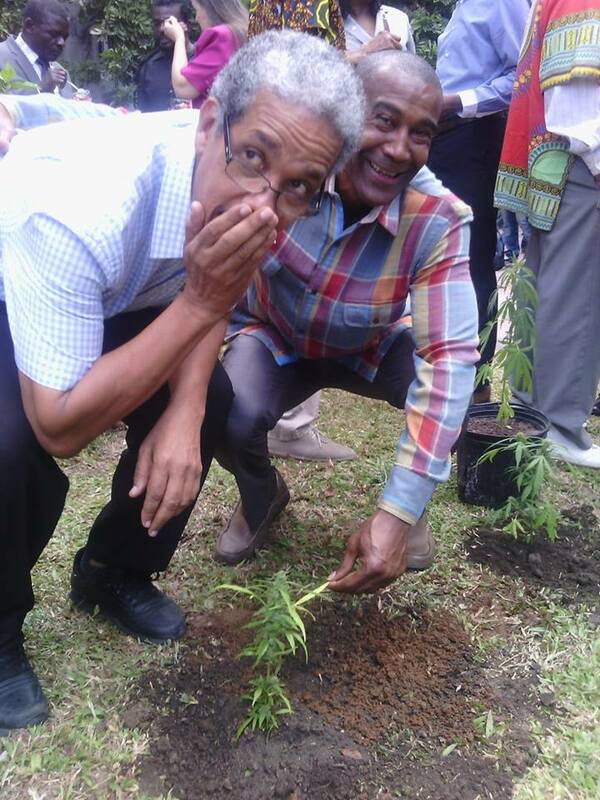 And just like that, the plant went from a national security threat to simply another plant in the lush paradise that is Jamaica. If you look hard at the photo, you should not be able to observe any Armageddon like catastrophes unfolding around the plant. In fact, with rich soil, sunshine and a little rain the plant starts to grow like all the other weeds. The winners here are, sick people who can benefit from the plant’s medicinal properties, farmers who will have another cash crop, people who want a health alternative to alcohol and baby Jesus who told me in a dream last night that cannabis is his idea of a good time. The losers are the lazy police and politicians that profited from harassing a free thinking segment of the population, the rabid prohibitionists, the racists that didn’t like “them niggers getting all uppity” and obviously the pharmaceutical and alcohol industries. Our choice as a community is to lend our support for a loving, science based group of evolved humans or continue with the greedy, hate filled spineless shits that currently rob us blind while condescendingly assuring us that they do what they do for the greater good. Well done Jamaica, Bob Marley would be very proud. Uruguay, parts of America, Holland and now Jamaica have proven that cannabis is not a big deal. Like camera phones making the police act better, cannabis legalization makes our system of government change for the better too. Sorry grey bureaucrats that are just waiting for retirement, but we actually require that you do some work. Legalize and regulate the plant so we can figure out how best to use it (AGAIN) for the betterment of society. Sheltered from the last of the bleak winter that folds around the old, wood built cabin that passes for their church, these cannabis evangelicals are in surprisingly good humor. Each Tuesday they meet and discuss their faith. Sometimes traveling miles so they can sit and contemplate life from within the warm embrace of their church. Recently the congregation has grown, they are now looking for a larger chapel to help them spread the word. Due to the persecution they get from non believers, the church has remained a closely guarded secret. The familiar, loving experience that is a visit to their weekly service, stands in stark contrast to the prohibition horror stories each member has had to endure. They have all, quite literally suffered for their faith. Myself and about 30 other people take our seats when the pastor moves to the raised oak pulpit. Lily has been the head of this group for more than 25 years. She is a gentle, dignified looking woman in her middle age. As she beams down on us all, you can feel the room tuning into her frequency. “Welcome everyone, I hope we don’t have any members left stranded out there in the blizzard”. Lily went on to tell us about the role she sees for the church, as well as sharing wisdom and humor. The church is to be an example of compassion and evolution she said. We are here to share experiences, to embrace ourselves and the wider community. She reminded us that this is our one and only known chance to live and celebrate the here and now. All of creation is a sacred gift for us to enjoy. We must rediscover sharing and cooperation if we are going to build the perfect society which allows both us and the natural world to thrive. We begin with ourselves. Finding out who we really are is a sacrament. Trying to live by the standards that Mother Nature has given us is a fundamental goal. In short, trying to be the best version of ourselves. Once we understand who we are and what direction we would most prefer our lives to take, we get on with it. Make it happen and help those around you that want the same thing. It is your religious duty to be in a constant state of learning. We are here to evolve. You have to judge your actions based on the entire consequences of those actions. We are part of the problem until we become conscious enough to do our part to promote a better society. She spoke at length about our duty to be authentic. Working together is more fun. Sitting in a grey, work cubical and punching things into a computer is not the full expression of humanity. It is a perversion. We were not meant to be seven billion strangers on the planet. We are family, Asian cousins, Indian uncles and European aunts. At our root, we are all from the same species, sharing the same bit of rock hurtling through infinite space and time. The non believers that oppress us believe that they are outside of nature and are masters of it. This is the same situation as when a small child throws a temper tantrum at its mother because she will not let the child play in the busy street. We are from nature, we are nature and it is time to become a more natural society. We have amazing technology and intelligence, so lets start channeling that smarts into practical things that can save the planet. Modern society is sick. Consumerism has not turned out to be anything other than a business scam to pollute the planet while benefiting only a handful of sociopaths. The vision Lily has for society is beautiful. I don’t know if it was the ideals or the wicked white widow that made me tune into the church. All I know is that I will be attending next Tuesdays gathering. As we become adults there is a certain amount of disappointment that comes with growing up. Things keep changing. Those golden yesterdays will fade whether we like it or not and in the end, the only thing we really ever have is the present moment. Look around you, this is it. The perspective we choose to view this moment with however, is up to us. Looking up at Lily I choose to see the world as a smile. I don’t know how practical this religion is, but I sure hope it catches on. Drinking alcohol is an acceptable vice. Cannabis, just to remind you, is an evil, corrupting activity. If you look at the American intoxicant landscape, the big alcohol drug pushers are the good old boys just giving America a little fun on the side. At this point it is useful if you actually have a glass of vodka because it makes the rest of the argument a little easier to swallow. Violence, both domestic and random acts, are inspired by booze. Mayhem on a Friday night ending with a bunch of half wits standing around filming out of control child adults in an almost ritualistic fashion. But just to be clear, alcohol is the good drug. It has been at the heart of every Super Bowl and American holiday. Yes it is true that it is viewed as a poison by your body. If you can’t break it down and expel it quickly enough then you my friend, will die. Alcohol is addictive and promotes the rotting of ones insides in a slow, meandering way. But in fairness to the drug, it can be fun and relaxing if you only have a few glasses. If you consume a well grown cannabis sativa strain then you will have a similar buzz to a few drinks. Being talkative and social are side effects of the plant. Happiness rather than aggression is promoted and while you are blissfully chatting with friends the plant is healing the inside of your body. Sounds like a good deal right! You get to relax and have a little healthy, stress free fun. Maybe it might be helpful for the reader to have another glass of vodka at this point. You see, the bad drug (alcohol) is actually sold as being good, and the good drug (cannabis) is labeled as bad/wrong/evil/dangerous/immoral. We have had our minds made up for us with years of cynical propaganda. Yesterday’s alcohol prohibition criminals are today’s upstanding members of society. Forget about Al Capone, now slick boardrooms are filled by money loving capitalists who have grown fat on the legal alcohol heist. The anti pot side (the dark side) have given up trying to have a sensible debate. Before the internet we had limited access to real information but since the turn of the new century we have been surfing an information tsunami. From our sweet government’s point of view, we have a dangerous amount of knowledge. The free internet debate is the first attempt to limit the uninhibited flow of information. Back in the last century government and corporations monopolized what we heard and read. Today, smart arse punks like praguepot can deliver science and facts that compete with corporate propaganda. While we don’t have the same budget at praguepot, we do have access to the same knowledge. We don’t need more proof. Government is lying to us and are dead wrong to enforce cannabis prohibition. Medical marijuana is real. Expensive medication that is toxic for our bodies can be replaced by the plant in many cases. Last night this writer went to bed with a pain in his lower back. I took a cookie before falling asleep knowing that the powerful anti inflammatory nature of the herb would take the pain away and begin to quickly sooth the problem. Today, not only was the sun shining, but the pain and stiffness was gone. This is a tiny personal example of what the plant does. From chronic pain sufferers to cancer patients, the plant promotes the healing of damaged bodies. For recreational users, organically grown cannabis is an excellent health supplement. Studies show it protects the brain and promotes Neurogenesis (grows new brain cells). It is not weird or wrong to choose pot over alcohol, it is the evolved, smart choice. Our world is full of violence and aggression, ironically the plant that promotes the opposite emotions has been attacked with aggressive ignorance. We owe future generations a better world than the warring, polluted planet we have today. We need change, a move away from capitalist inspired ideals of greed and isolating hate. Today’s decision to get involved leads to tomorrows unstoppable momentum, so get busy reading and then get active in your local area.